It reveals the destiny of man, his past, present and future, using the thumb impression and comprehensive details about one`s life is read out from the palm leaf. Predictions were written down in Tamil and they are called Nadi Granthas. 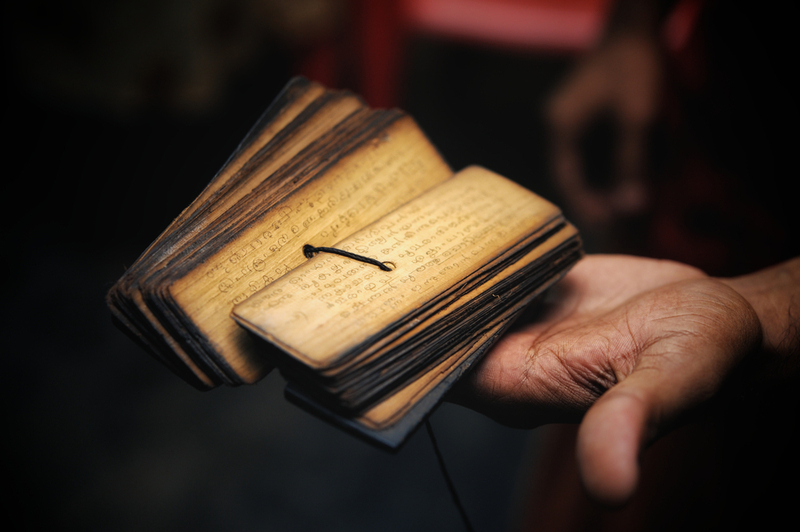 Granthas are manuscripts divided into 16 chapters or Kandams. The various chapters give details about the seeker`s family, profession, marriage, children, future happenings, disease, prosperity, family, friends, bad habits and associations, spiritual inclinations, auspicious happenings, death, foreign trips, litigation and a complete overview of life. It also gives the causes for present birth`s karmic struggles and ways to overcome them through suitable remedies. Predictions made by the Rishis conquered time and when the leaf is read, names of parents, current position in life, reasons for seeking the reading too is mentioned in the leaf. Nadi Readers say that the seekers would come on their own accord in search of the leaves at the destined time and thumb prints of the palm is taken (right thumb impression for the male and left thumb impression for female). There are 108 categories of thumb impressions that are classified by the seers. To find out the exact leaf of a seeker, he is asked to answer a set of questions based on the verses in the leaf. Nadi leaves are also classified accordingly, based upon the different thumb impressions. The exact leaf tells the names of the seeker, his parents, and spouse and gives out details that are written in the leaf. It would be a general overview of his life in the future. Some details would correspond to the present or past. Each leaf has a different answer to a seeker. One tends to seek this form of divination only if he is destined. Very strangely the leaf also mentions at what time the native will appear to take his reading. The native only at the predestined hour gets to read his leaf. It is very divine in essence. It is believed that Lord Shiva has destined a life for every soul in all its incarnations and if he wills, the particular soul would seek a reading to understand the life patterns emerging in that particular incarnation. Ganesh Nadi states, “Any genuine nadi is based on the 360 degrees of the zodiac, divided into the 12 signs, each containing 150 whole nadiamsas or 300 half amass.” Ganesh Nadi is considered to be very accurate in its interpretations as it is divided into 1800 nadiamsas for each of the 12 signs. Ganesh and Sahadeva Nadis contain a total of 21, 600 basic descriptions of destinies of men. The figure of 21, 600 correspond to the amount of inhalations and exhalations made by a man in a day. The breath, the five elements of the body, astrological fundamental knowledge and insight are composite of nadi prediction, say the yogis. • It depends mainly in the identification of the right leaf. • The Nadi Astrologer should be proficient in interpreting the verses in the nadi leaf. • Different types of nadis have different ways of interpretation. It is said by some texts like Jaimini, mantra nadis will have predictions of the future in an uncertain manner. However there are different types of nadis like Rishi nadis, tantra nadis, and prasna nadis. Though predictions of future happenings are made, many happenings can be changed by initiating positive actions in the present. Remedies, introspection, repentance, prayers change the course of action thereby changing destinies. Rishis out of infinite compassion for the suffering humanity have written them down; so that man can understand about his patterns, strengthen himself through moral discipline. For many births, one would have been a habitual offender and would undergo suffering due to this trait. If he is destined to take the reading, it would state the reason for such a condition and direct him in ways to overcome such shortcomings and seek a better life. It has a divine message to all who seek the reading. Faith plays a vital part in this predictive science. One should believe that the leaf would never be wrong as it is pre determined by Lord Shiva that one takes a reading, gets spiritual instructions and acquire the soul force to shape oneself. One suffers due to actions of unalterable past, which is to be overcome. As Swami Vivekananda said that there is something behind the will that is free, it is the soul force within each one that helps one to be free to shape one`s destiny and Nadi certainly helps in discovering this soul power.